IN ADDITION to being one of the most magnificent and long-lived plants, the sequoia is distinguished by having one of the most ancient lineages of any living species. Evidence of the sequoia's antiquity is sustained by fossilized remains found buried in the mud and silts of early geological periods. The family probably began to appear with the tree ferns, ginkgo, and other land plants during the period when giant lizards, ichthyosaurs, and dinosaurs roamed the earth millions of years ago. At least a dozen species of sequoia are known to have occurred in many parts of what is now the United States and in central and western Europe. 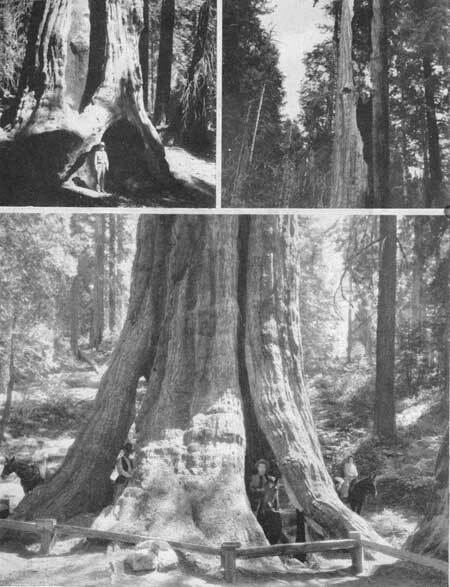 During the period when the oaks, maples, hickories, and other hardwoods of modern time were developing, it is probable that the several species of sequoia were almost as abundant and widespread as the pines of today. At least one of the several species grew practically everywhere in the Northern Hemisphere and their fossilized cones and foliage differ but little from the living specimens of the present day. The sequoias were particularly well adapted to preservation because of the slow disintegration of cones and foliage and the tannin content of the wood which retarded decay. In Yellowstone National Park fossilized sequoia trunks 6 to 10 feet in diameter and 30 feet high may be seen standing in the midst of several species of modern trees. Sequoia fossil beds have been found in several parts of North America, Europe, and Asia. It is probable that the rapid decline in distribution of the sequoias and the complete elimination of all but two of its formerly large number of species may be attributed to volcanic eruptions, the creation of large desert areas, and the climatic changes that occurred several hundred thousand years ago. The more recent history of the sequoias is imperfectly known since few fossils of this period have been found. Nature is unable to expand the present natural range of the two remaining species because of the exacting limitations imposed by elevation, climate, and the influence of fire. During 1947, living specimens of a third species, the metasequoia, or Dawn Redwood, were discovered in central China. The only previous record was in fossil beds. None of the present groves of giant sequoias are growing on recently glaciated ground. The glaciers that swept down from the Sierra Nevada in relatively recent times (20,000 years ago) were often less than 5 miles distant from many of the present-day groves of sequoias. Glacial action may be one of the major causes for the limited distribution in scattered groves. FIGURE 11.—Fire scars are everywhere visible in the groves.